Another shrimp-tastic quickie dish for your summer months. In other news, my kid loves lentils. Who knew? What's involved in this tasty dish? Put your raw frozen shrimp in some cold, salted water to thaw and brine. 16 shrimp was good for two of us. Your call. While that is happening take one half cup of washed and inspected dry green lentils and bring them, along with one cup of water, to a low boil in a saucepan. If you are making a full cup, use two cups of water, and so on. Reduce the heat to low immediately and cook them for 15 minutes. 20 minutes or more will cook them completely. Pull them at 15 so they can finish cooking with the shrimp. The water will cook off, so add more as needed to keep them covered. While the lentils cook chop some carrots and onion. Sweat them in a skillet with two tablespoons of olive oil. When the lentils are still slightly crunchy pour them, along with the pot liquor, into the skillet and mix stir into the onions and carrots. If you are doing a full cup of lentils, use a large skillet. Turn the heat up to medium and add the shrimp. Hit it with a pinch of salt, remember that you brined the shrimp, and some fresh pepper about now. 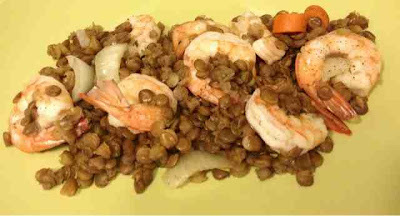 When the shrimp are cooked through, the water is reduced, and the lentils a little softer, serve it all with some good, soft bread and butter.